Looking to create a relaxed coastal atmosphere in your home? All you need is a little bit of help from Coastal Blues. Written by renowned designer Phoebe Howard, this book focuses on decorating your home with the colours of the sea and sky – ranging from soft, pastel shades to deep, rich tones of blue. Filled with stunning photography, its filled with inspiring images of beach houses, seaside manors, quaint cottages and coastal getaways. 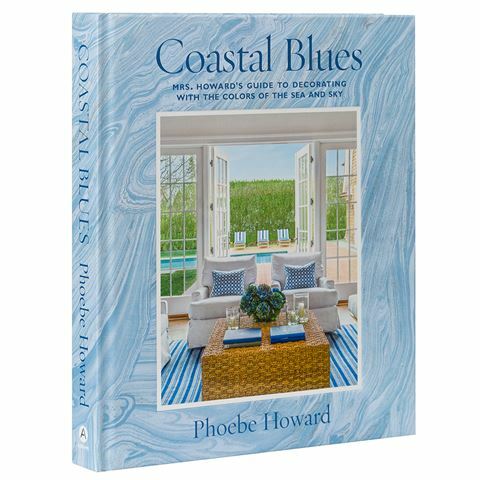 With chapters that showcase everything from vibrant bursts of deep blue to toned-down pallettes, Coastal Blues is your guide to enrichening any living space with a charming, beach house atmosphere. Written by designer Phoebe Howard. Interior design guide to decorating your home with the colours of the sea and sky. Divided into chapters – Sea Glass, Coral Reef, Deep Blue Ocean, Clear Water, Indigo Bay, Ocean Mist and Trade Winds. Filled with brilliant designer tips and tricks. At the end of each chapter are four colour palettes to help you piece together your décor. Begins with an introduction by Howard. Acknowledgements at the back of the book. Dimensions: 22.5cm (l) x 26cm (h) x 2.7cm (w).